"Americans want to watch high quality video content on their phones just as they can on their TV or computer at home," says Shin. "They want easy multitasking on their handset. They are demanding of services such as real-time traffic reports, 3D Maps, and directions." That's true! But what exactly does that mean for Samsung? The Galaxy S marks Samsung's renewed focus on screen, speed and content. That means "Super AMOLED" screens that are 20% brighter 80% less reflective, and with 20% better battery life. 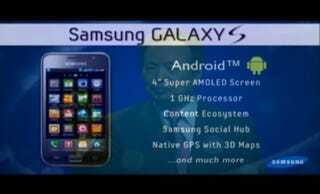 For speed, Samsung's introducing that 1GHz processor, for better multitasking, browsing, and graphics and video handling. Content seems to be the main thrust: says Shin, "Without content we will never give consumers what they want." Samsung's collaborating with content partners to provide full-length movies and TV shows that will be optimized to take advantage of the Super AMOLED screens. They'll also be providing books and magazines directly to Samsung mobile phones. No word yet on pricing or availability, other than "soon," or on which carrier we'll see the Galaxy S on. LAS VEGAS—(BUSINESS WIRE)—Samsung Electronics Co. Ltd., a leading mobile phone provider, today introduced the Galaxy S (Model: GT-I9000), a smart phone that makes users' lives more convenient, more exciting, and more integrated. JK Shin, president and head of Samsung Electronics' Mobile Communications Business announced the global launch of the Galaxy S at his keynote speech at the International CTIA Wireless 2010. The Galaxy S will be available in Europe, North America, Latin America, Australia, and Asia soon. The Android-powered Galaxy S incorporates a 4-inch Super AMOLED screen and a 1 GHz application processor that enables vibrant HD videos, rich augmented reality content through Layar Reality Browser, and advanced LBS (Location Based Services). The ‘Social Hub' provides always-on social networks connectivity allowing users to enjoy communications with their friends, colleagues, and families whenever they want and wherever they are. The Galaxy S is designed to provide immersive, intelligent and integrated experiences, with the power to enrich people's lives through best-in-class services and technologies. The Galaxy S will allow users around the world to experience the "Smart Life," which Samsung anticipates will shift the way that consumers view smart phones and how they interact with them in their daily lives. The Galaxy S immerses users in a world of rich multimedia. The large 4-inch Super AMOLED display delivers unrivalled screen quality, with less reflection, free viewing angles and super-fast touch-response. The mDNIe (mobile Digital Natural Image engine) – a technology used in Samsung's best-selling LCD and LED TVs – boosts an even sharper and crisper viewing experience for photos, videos, and e-books. It creates a perfect environment to record, edit and play HD video, to browse the Internet, and to read your favorite e-books. A variety of applications from Android Market™ allows users to even more extend the benefits and excitement of smart phone experience. Plus, users have access to Google™ mobile services, such as Google Search™, Gmail™, and Google Maps™. Living a "Smart Life" requires intelligence, and the Galaxy S delivers just that by utilizing personal preferences to gather information online that each user needs and wants. With a user-defined daily briefing, lightning-fast processing speeds and location-based search options like Layar Reality Browser – the Galaxy S gives users the information they need wherever and whenever needed. The Galaxy S represents the next level of intelligence in smart phones. "The Android-powered Galaxy S will set a new standard for smart phones," said JK Shin, president and head of Mobile Communications Business. "The Galaxy S is the perfect device for people in all corners of the world who want that extra edge; to be more effective, productive, better connected, and in tune with their smart life – both personal and professional – all in a very easy and simple way." * Home Cradle: Enables use as a digital photo frame, table clock, calendar, and music station.